Despite its supposedly austere lifestyle appeal, India ranks as one of the highest garbage generating countries in the world. About 60 million tonnes of garbage is generated every day, and the sizes of garbage heaps continue to rise by the year. Despite the progress of campaigns like Swachh Bharat, the daily contribution of garbage has not been impacted and the issue will continue to persist unless we, as citizens, target the source rather than the manifestations of this issue. As the saying goes, ‘charity begins at home’; only if we start to take active steps to curb individual waste generation, can something be done about the hazardous quantities of waste that the country produces every year. A great way to begin would be by managing your domestic, everyday waste better. Not only will it make your house a green haven, but switching to a waste-free lifestyle is also highly cost-effective and reduces expenditure on unnecessary wastes, especially plastic, that can easily be avoided. Here are five tips for better home waste management so that you can play your part in keeping the Earth a greener, healthier planet. Paper bags, packing material, not to mention items made of plastic, are not only unnecessary clutter but are items that can so easily be replaced. Look for food and water that are packaged in minimal packaging material to avoid bringing in waste into your house. Buy groceries and meat from farmer’s markets to ensure that products are fresh and free of preservatives and packaging. Ensure that dairy products are bought fresh and not from supermarkets selling them in frozen forms. Food items are amongst the most waste generating items in the household and are usually unavoidable. Go green and prove your pre-existing convictions wrong. Ban plastic from your household. Switch to cloth bags, reusable water bottles and solid steel cutlery to banish their plastic counterparts. 90% of the waste generated every year is non-biodegradable, plastic making up a significant part of this. Today, plastic is more of a habit than a necessity, and this is one of the easiest places to start when you plan to have better home waste management. Ensure you carry a cloth bag whenever you go shopping and carry your own reusable water bottle. It is important to understand the kind of waste you generate and keep the non-biodegradable materials to a minimum. 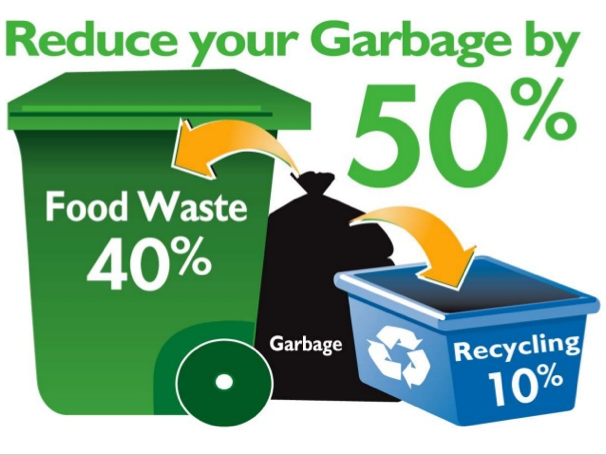 Separating your waste can be a great place to begin to understand your own consumption levels. Separate your waste into two piles—dry and wet. Wet waste generally comprises organic, degradable material and needs to be disposed of on a daily basis. Dry waste, on the other hand, can be collected for a week and then disposed of at the end of the week. Sanitary products need to be collected separately and deposited in hazardous waste bins intended for a landfill. Electronic wastes should be separated and deposited in e-waste collection centres authorized by the pollution control board. Separate organic, degradable compost from the recyclable contents of your waste and try and employ useful ways in which you can use your compost around the house. For instance, wet organic waste is a great fertilizer for plants and also makes for good composting material. Make sure this goes into a composting bin and avoid piling it into the already overused and overflowing landfills. Work towards reducing the recyclable materials pile as well by attempting to recycle as many items as possible within your own home. A lot of what you consider trash can, in fact, be reused, or at the least recycled, paper being a large part of the latter. Make sure recyclable products are sent to proper recycling facilities rather than ending up in a landfill or a garbage dump. There are different kinds of composting, some that allow for only plant products and some that allow specific kinds of animal products as well. Composting is a great way to ensure that nutrients do not go to waste and are in fact returned to the environment. Pick a compost site in a shaded place near your house and choose to begin either a hot compost or a cold compost. Pile in fresh waste into the compost bin and turn it over as and when needed. In a couple of months, this wet, mushy slump slowly hardens and takes on a rich earthly texture that is rich in nutrients. This can be used as a fertilizer for your home garden or simply as fresh soil for your lawn or nearby areas. It has no foul smell and is extremely rich in nutrients for the environment. These are simple steps that you can take to ensure that you and your home are not just healthy and clean, but are also conscious of the environment you live in. Reduce your carbon footprint and take your share of the burden of pollution. Little drops of water make the mighty ocean—it is with these small steps that one can achieve bigger ones. Lead a healthy and happy life knowing that you have played your part in making the Earth a cleaner, greener place to live in by going eco-friendly and preparing your home for summer! Lancor has employed water savings, energy savings and better waste management process as stipulated by green building council for their “TCP Altura” project in Sholinganallur. We are proud to say “Lancor TCP Altura” is the first Pre Certified Edge Rated building in Tamil Nadu.